Okay, it's not just in gold, it's also in red or black, but who wouldn't want GOLD!?! So recently, I've been looking at a lot of USB-C cables and accessories. Mainly as many are looking to switch from their older, non USB-C device to the new Galaxy S8 which has it; but also because my wife switched from her LG G4 to the Moto Z Play. I can't just chuck out the bag of cables yet. 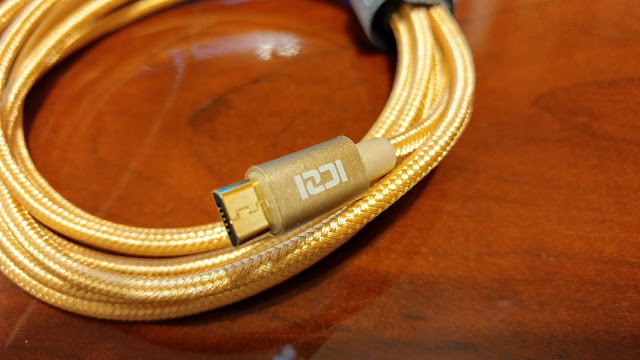 So what kind of cable should I keep around? 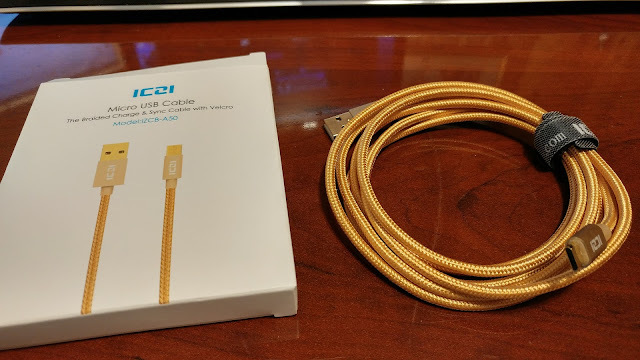 Well, back to ICZI, as I've really liked their quality in the USB-C stuff, so I nabbed one of their gold 6ft cables. I especially like that it comes with the velcro strap again and there's a solid connector so that it's not going to bend there. Now, how will it fare against my son? That's yet to be determined, but for $10 for the cable, I think it's probably the best deal out there for a quality cable. Sure, I can get cables for very cheaply, but not braided or as sturdy. Great purchase (and it matches my ZTE Axon Pro)!